Rhizome | Blog Posts tagged "Kate Crawford"
Kate Crawford and Laura Poitras | Tue Jun 9th, 2015 11 a.m. 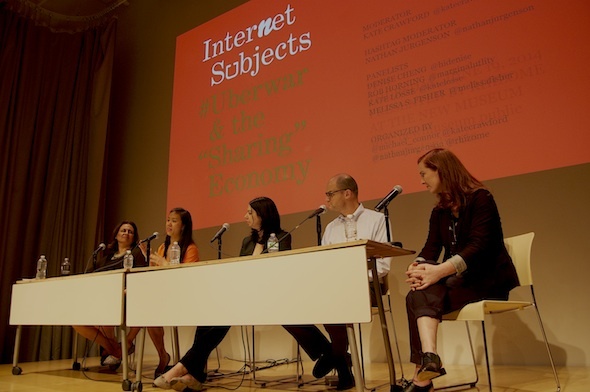 In 2015, at Rhizome’s Seven on Seven event at the New Museum, Poitras and Crawford were invited to give the opening keynote address. They had an on-stage conversation that spanned the cultural imaginaries of surveillance, affect and emotion, and the physical effects of producing work on surveillance. The week beforehand, Poitras and Crawford travelled to China to observe the collaboration between Ai Weiwei and Jacob Appelbaum - one of the collaborations for Seven on Seven. 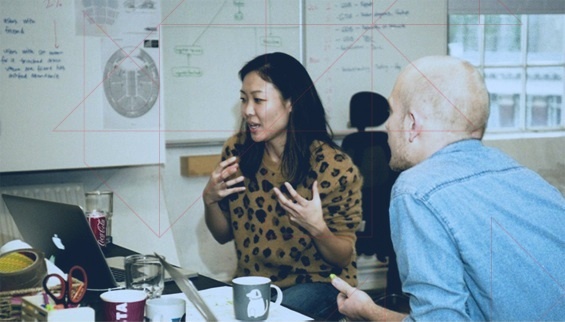 Laura created a short film based on this time in Weiwei's studio, called The Art of Dissent. This transcript has been edited and some topics have been expanded upon by the authors. It was originally published in print form by the cyberfeminist group Deep Lab as part of their residency at the New Museum's Ideas City Festival in May. This layout is based on the zine's design, by Ingrid Burrington and Maral Pourkazemi. Kate Crawford: It's a pleasure to be here with you, particularly on a year when Seven on Seven is focused on surveillance and affect in art and technology. I was thinking about CITIZENFOUR and the whole trilogy of your films since 2001. You’ve managed to take this invisible, pervasive infrastructure of surveillance – what the sociologists Haggerty and Ericsson call the "surveillant assemblage" – and you've made it feel material and emotional. In your work we see how surveillance functions in a political and technical sense, but it also becomes something that we really care about. It's personal. You've been asked many questions over the past year about the legal and policy implications of mass surveillance. But I want to do something else; I want to ask you about the cultural and artistic representations of surveillance and how they've affected you. Are there particular films, books and art works you’ve encountered over your life that have changed the way you think about surveillance? Laura Poitras: Yes, there are many. When I first decided I was going to make a film on surveillance it was before any whistleblowers had come forward. It was before Snowden. It was also before the "NSA Four" – Thomas Drake, William Binney, J. Kirk Wiebe and Edward Loomis – went public in 2011. I talked to a lot of people and everybody said it's a bad idea to make a documentary film about surveillance because it is hard to visualize. It is both abstract and very much a mental state. When you think about the great literature and films about surveillance, most are fictionalized. The work that had the most influence on me is Orwell's 1984. I read it first when I was a teenager and it was etched into my memory. I can't think of another book I've had such vivid memories of. I re-read it in the winter of 2013 when Edward Snowden first started emailing me. I was also reading Cory Doctorow's Homeland. They were a perfect pair to read because of how they capture themes of surveillance, paranoia, and the state. Mike Pepi | Fri Jun 20th, 2014 1:35 p.m. Enormous amounts of capital have been amassed of late under the banner of the so-called "sharing" economy, characterized by companies such as Uber and Airbnb that have garnered multi-billion dollar valuations for creating platforms in which individuals offer their services and property for rent. Such platforms have advanced a narrative in the media that their services are emancipatory and disruptive of old-fashioned, inefficient industries, going so far as to promise "revolution" amid broken systems. But what, exactly, is being brought into existence by this revolution? And who is it for?